Proceeds for our 2018 fund raiser go to Merge Memphis. Donations are accepted at the meeting. All donations qualify for entrance in our drawing for a $300 Visa Gift Card. Hi! We are Keith and Sherry McClure, co-founders of Merge Memphis. We are both full-time nurses, trying to make a difference in our communities. 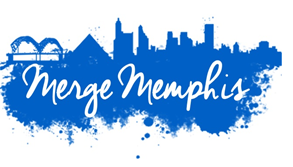 Merge Memphis is a faith based 501c3 non-profit in Memphis, TN. We have a strong passion and are lead to help those less fortunate. ​Our Goal is simple, we're working to feed hungry people. Whether at shelters, through family food box delivery, or in the streets. We help find homes for the homeless in conjunction with partners and clothe those who need clothing by supplying clothes for shelters and individual families in the greater Memphis area. Simple, right? But we need you! Our teams consist of dozens of volunteers serving in different areas, but all with the same passion. We started forming "Teams" in October 2014, obtained our non-profit status March 2015 and have been going strong since! We are proud to operate the only non profit food truck in the Memphis area. It's "the truck that gives back." Our Food Truck serves two purposes made simple in one statement: "Feeding Memphis to Feed Memphis". We set our food truck in random places around the city and sell food to office buildings and drive by patrons. We also set the Food Truck up for special events and parties. We also set up in random neighborhoods around the city, feeding anyone who is hungry free of charge. Half of every purchase from our food truck goes directly to projects we are currently working on, the other half goes directly back to the truck for food and supplies. That's how it work, and we'll love for you to join us on our next outing! Thanks to your donations every month Merge is currently serving eight Shelby and Desoto county families with Food Boxes every month. Through the faithful service and leadership of Scott and Kelli Bergstrom, we're able to provide this basic need to these families, but we need your continued donations to keep providing for them! Whether it is a food donation, a Kroger gift card, or connection with non-perishable items, if you get them to us, we'll get them to hungry people. The Opportunity Center is part of the Union Mission family located in Downtown Memphis. It is a shelter that provides economical housing 45 men trying to get their life "back on the right track". We adopted this shelter in October 2014, and we feed these men a few times a month. Through this simple act of feeding men, we have formed relationships with these men, and now they are part of our "Merge Memphis" family. Whether by providing clothes for their clothes closet, bus passes for the men there to travel to job sites, church, or school... the Opportunity Center provides many opportunities for people to volunteer. This is a brand new ministry starting in April 2016. It will take place every year from April to August. Look for your invitation soon! We will work as partners with area women's shelters to provide the women who live there with new bras, underwear, and women specific personal items. What can you do? Come to a party or host a party! Buy women specific items we request and bring them to the party, and have fun with friends while serving others. ​Merge will then package these new items and deliver to the shelters. What a great way to help others! In September 2016 three "Little Free Pantries" were installed around Memphis designed to provide basic food items to whomever might be passing by. These are strategically located in areas of need in our city. Two of them can be found in the Binghampton community and one is at the intersection of Getwell and Mallory. Each week, volunteers fill these pantries with non-perishable items ensuring they're always ready for anyone who might have need. If you're interested in filling a pantry, donating food, or giving financially to make this a reality, we would be so appreciative, and so would our friends who lean into these food pantries to make it from week to week. In the winter months, we also stop at all the bus stops up and down Poplar Avenue leaving bags of gloves, scarves, hats and socks. We then go to Court Square and hang warm items on the trees. You don’t have to profess a need to take any of the items.